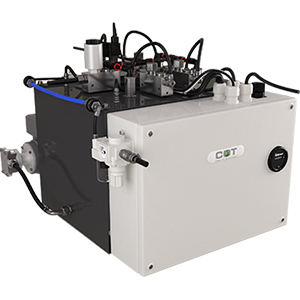 COT Oil Refiner® placed within the COT Catch Tank is the key component in COT Oil Refiner® System. With its patented point-heating method, water molecules are released from the oil without the risk of oil oxidation. By choosing additional components, the system could be optimized to the customers’ specific needs and requirements. When tank size exceeds 2000 liters, additional units could be recommended to be installed. Returning oil from the catch tank will be connected directly to the the main oil system without modifications on the ordinary tank or flow system. Flexible installation enables the possibility to install the Catch Tank optimized depending on the existing equipment.